Over the past several years I have primarily worked from home. Two years ago I accepted an office position and since then, have worked in an office five days a week. One of the biggest differences I noticed was how much my expenses changed when I was required to work in an office setting versus having a home office. As I start to transition from full time employee to freelancer, I am excited that I will save money working from home. Commuting has been one of my biggest expenses over the past two years. Originally I rode the bus to save money and spend around $100 a month on a bus pass. A few months ago I made the costly decision to start driving to work, which sets me back around $300 a month. While the parking is expensive, I also use about 3/4 of a tank of gas each month. Once I start working from home, this will be a substantial savings. I will save approximately $300 a month on my commute plus $50 in gas. While I rarely eat out for lunch, the pressure to eat out is always surrounding me. When I see a coworker grabbing lunch and bringing it back to the office, it can be tempting for me to grab something. Coffee, on the other hand, is the devil an expense that I really struggle with each month. I've previously written about how much my daily coffee habit is costing me. Some weeks I do great and spend nothing on coffee; some weeks I grab a coffee every day. Because I will be working from home, I anticipate I will save anywhere from $25-$50 a month on coffee purchases. Although a small expense, I have enjoyed drinks after work with coworkers in the past. Whether it's celebrating a work achievement or a coworker's birthday, it's easy to spend $20 on drinks followed by a $15 Uber ride home. While I have eliminated this expense from my budget over the last couple months due to side hustling, it's one area of my budget I will definitely be saving in over the long term. Once I start working from home, I will be able to take deductions as a small business owner. Having a dedicated office space will allow me to have tax deductions on a percentage of my rent and utilities, as well as office supplies, my cell phone and more. While this is hard to measure physically, the amount of time I will save commuting will save me money in the long run. In fact, it will help me make money. By gaining back sixty minutes of commuting time a day, this is an extra hour of productivity I can achieve working. This adds up to five hours a week, or an extra 20 hours a month. I am unsure of how much money I will be saving, but I expect the savings to be several hundred dollars a year. 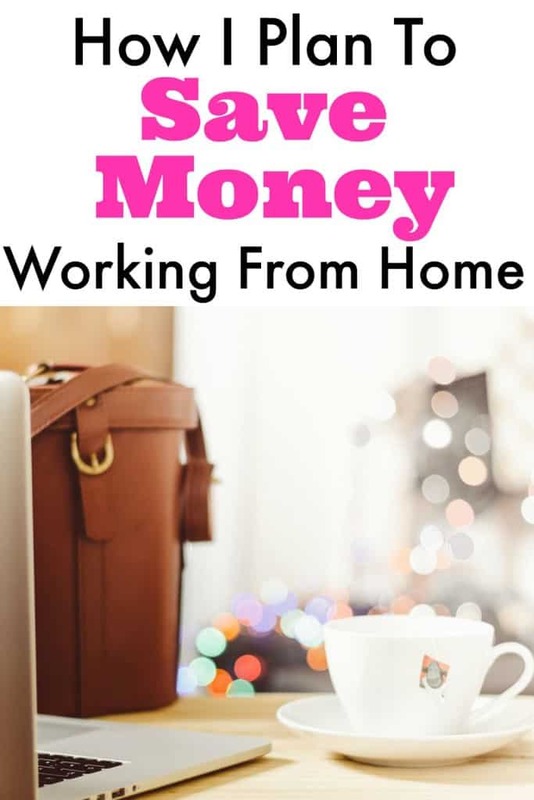 These are five different ways I plan to save money working from home. Altogether, I anticipate saving a minimum of $400 a month instantly by not commuting or buying coffee. This is a substantial saving that will be effective immediately once I work from home and I'm excited to start saving money each month! Sounds like you have a great plan in place. It’ll be fun to see how much of these come to fruition when you make the swap. I’m a huge fan of our at-home espresso machine. It’s fairly cheap, but makes a decent espresso. It’s a Mr. Coffee ECMP50. Of course, that’d mean spending more money, but maybe you have some Amazon Gift cards from swagbucks? Oh, and I just remembered that the espresso machine goes through WAY more coffee, so maybe that’s not the most frugal idea. It sure is tasty though! Haha! I use a Keurig I received as a present and it’s ancient – probably one of the first ones made when Keurig came out with them. I have a Capreso maker that makes the foam and it’s actually amazing. I am going to try sooooo hard to not buy coffee out, ha! Purchasing coffee is not a terrible habit of mine. I, like you, vary between no coffee and coffee daily. I’ve blogged about monthly goals to eliminate coffee altogether but thinks I’d be setting myself up for failure. I think the more cost effective option for me is to begin making it at home. I cant imagine the amount of money I’d be able to save if I began working at home. That’s not a current goal of mine, at this time, but I’m not opposed to the idea. The coffee struggle is real! I just budget it in now with my spending since there’s no way I can give it up. I just started working in an office and oh my gosh the commute is AWFUL!!!! Luckily, I only have to go in three days per week, but sheesh – the whole time I’m driving I’m thinking about how I could be doing the laundry, hanging out with my girls, making breakfast, working, or freelancing. My commute is about 45 min one way, plus I do daycare drop off and pick up each day. It definitely adds up and that is such a negative of having to work in an office!